It's time to #RethinkCleaning with the New Hoover Floormate SteamScrub 2-IN-1 and the #PowerofSteam! I am saying "Good-bye" to my old mop and bucket method; Cleaning just took on a whole new meaning in my house! I am excited to share the news: my house is cleaner thanks to my new Hoover Steamer! Who gets excited about cleaning their house, you ask? A mother of three with dogs living under the same roof does, that's who! 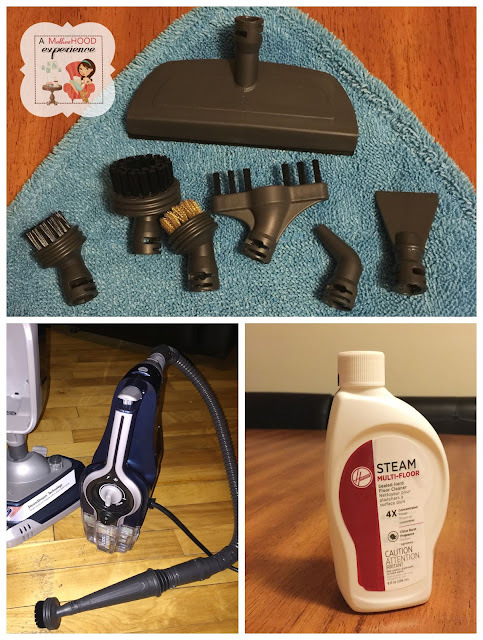 I had an idea of how steam cleaners work, I have used similar ones in the past. The basic idea is that they blast away germs and bacteria with hot steam, leaving everything clean and fresh. What I didn't know is how incredibly wonderful the result would be after using the Hoover Floormate SteamScrub 2-in-1! Typically my routine involved sweeping and washing my floors with the old "mop and bucket" method, vacuuming the carpet and when it comes to things like curtains - I take them down and throw them into the washing machine. All of the above - no more. No more sweating and scrubbing for what I think is a 'deep clean' only to realize within a couple of hours that all that work and I just skimmed the surface. Let me tell you about the Hoover Floormate SteamScrub 2-in-1. It's not your average steam machine, it's so much more! It sanitizes, kills and removes 99.9% of household germs in sealed hard floor surfaces. It removes tough stains with SteamStream Technology. The Floormate SteamScrub can be used as a floor steamer. It comes equipped with two floor pads for steaming and the carpet glider. Steam cleaning anywhere in the house got easier with the lift away steamer that attaches to 12 different interchangeable tools for just about any job. Steaming your windows clean, refreshing your office carpet, getting the dirt out of your living room curtains and cutting through heavy stains with the tile and grout scrub brush. It also comes with a storage bag for the steam tool kit. It's easy to set up and get started, the instruction manual is step-by-step and easy to follow. The Hoover Floormate SteamScrub 2-in-1 comes with everything you need to get started including the Hoover Steam Multi-floor cleaner! You can find it online! Our floors take a beating every day and we know we aren't always getting the clean we want. I don't like to think about it but there is a lot of dirt, germs and bacteria that gets dragged through our family home every day. After using the Hoover Floormate SteamScrub 2-in-1 our floors looked and felt much cleaner than they had in a long time. I also tried it on our office area carpet and steaming it took out the musky smell that had been lurking around and left the carpet feeling fresh. 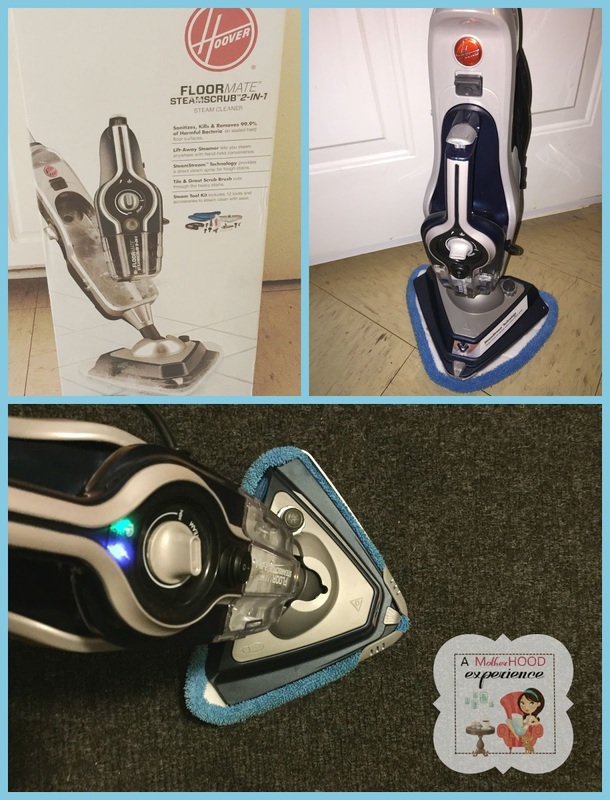 I am very impressed by the #PowerofSteam, this is my new secret weapon when it comes to giving things a thorough cleaning. Check out my review video below and subscribe to the #AMEblog YouTube channel! Do you own a Hoover? Have you tried the #PowerofSteam? Follow @HooverCA on Twitter and #RethinkCleaning! Posted on behalf of Hoover Canada. Complimentary product received for review purposes. Comments and opinions on this blog are those of the author. Video and images created and owned by A Motherhood Experience Blog! Looks like a wonderful system - a much deeper clean indeed! I have seen these and wondered how well they worked. Thanks for the review. I really like that you mentioned they work on carpets. Looks like the perfect solution for freshening up my area rugs and runners.